With another year almost over, now is a great time to reflect and get back to basics. Here at iWave, our mission is to help nonprofits “raise more major gifts, faster.” But what does that really mean? How do you go about defining a major gift? In a survey of 700 nonprofits in North America, nearly 60% of respondents said their organization does not have a major gift strategy, yet 54% said major gifts are “absolutely vital.” Part of the issue might be that nearly 68% of nonprofits do not have a full-time major gift fundraiser. Okay, how about a full-time prospect researcher then? There’s a disconnect here. Nonprofits need and want major gifts, but three out of four nonprofits say the reason they don’t pursue major gifts fundraising is that they haven’t invested in the necessary resources and strategies. These statistics beg the question: are major gifts even worth the hassle? The answer, in brief: YES!!! Amy reminds us the “right” major gift is all about context. During her career, she worked at a Battered Woman’s Shelter where gifts of $1,000 were rare and considered “major.” Compare that to her time at Rutgers University, where a major gift was at least $100,000. For some organizations, even $100,000 is too low to be considered a major gift. Since major gifts consist of large sums of money, they are relatively rare. However, they can have a huge positive impact on an organization. 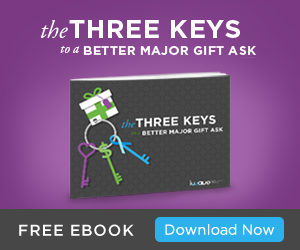 The right major gift could give your entire organization the breathing room it needs to accomplish its mission. This is not to say smaller gifts are not important. Many organizations depend on small donations and volunteer hours from a large pool of donors. However, did you know 88% of donations come from just 12% of a typical organization’s donors? If you’re going to find a major gift donor anywhere, you will probably find them in that 12%. But to find them, you’ll need the right tools and strategy. In theory a major gift donor could be anyone, but the vast majority of major gift donors have typical characteristics. They tend to already live in your donor database (not literally of course), have a passion for your mission (affinity), have a history of giving (propensity), and have the financial capacity to give (capacity). For more information on these indicators, read our recent Propensity-Affinity-Capacity Blog Series. According to the 2015 Nonprofit Times Report, 55% of all nonprofits reported a boost in major gift donations. Because of these donations, 77% report they are well ahead of their fundraising goals. If this isn’t your organization, it could be. Any effective strategy depends on a well-defined goal. A major gift strategy is no different. What would a major gift look like for your organization? If you’re not sure where to start, consider these numbers. About 44% of nonprofits consider $1,000 or more to be a major gift. On the flip side, 36% consider gifts of $10,000 or more to be major gifts. The median major gift amount is about $5,000. Once you’ve identified the dollar amount, run a report in your donor database to find which donors from the past year (or a date range of your choosing) have given at or above the goal amount. However, a simple report won’t reveal everything you need to know. 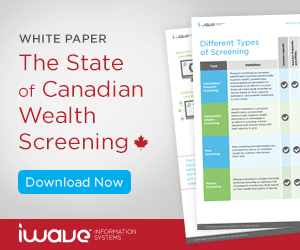 Consider a wealth screening. This service identifies and segments donors based off both internal (info within your database) and external (third party) data so that you have a list of your top potential donors. Using your internal data, you could prioritize your donors with a Recency, Frequency, and Monetary (RFM) score. Recency – What was the date of the last gift given? Frequency – How often did the donor give over the past year? Monetary – What was the donation amount(s)? Does it align with your goal? Based off the results of the screen, adjust your goals accordingly. Aim to focus on the top 10-15% of donors. These are your major gift donors and prospects. 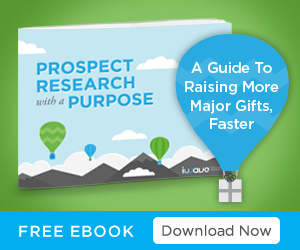 Consultant Jen Filla says that prospect research is the “secret sauce” to major giving. 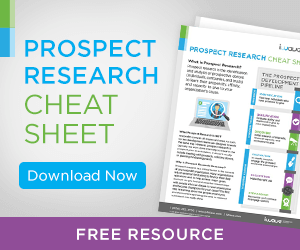 Organizations are most successful in their fundraising when prospect researchers are involved. The most successful companies, from small businesses to multinational corporations, are successful because they invest and reinvest in improving themselves. In many cases, research and development drive this improvement. Knowledge leads to growth, and therefore knowledge is a form of capital. Nonprofits operate with different goals in mind, but knowledge remains critical to achieving a greater positive impact on your cause and community. Major gifts do not fall out of the sky once in a while. They must be cultivated with a focused process involving research, development, and relationship-building. This process is not easy, and some organizations make the mistake of thinking “Anyone can do it.” Rather, prospect research and development requires a mastery of specialized skills. 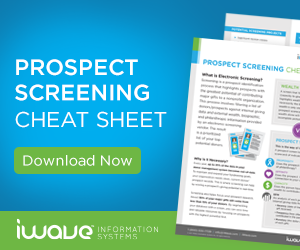 A wealth screen is meaningless without someone who knows how to dig into the data, verify its accuracy, and make recommendations on the best prospects. A major gift goal is meaningless without someone who knows how to build relationships with prospects, craft the right pitch, and inspire donors to give again next year. If your organization cannot afford to hire these professionals, consider retraining one or several of your team members to share the roles of prospect research and fundraising. Look for advice from other organizations and online. In order to realize an effective major gift strategy, prospect researchers and fundraisers must be present and active. If your organization is one of the 54% who claim major gifts are vital to success, you will want to have the right plan to earn them and the right people to get them. 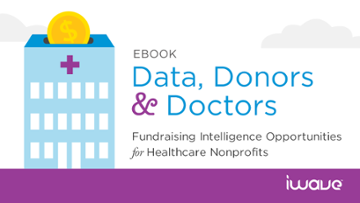 Researchers and fundraisers, share this with the decision-makers at your organization! Let them know that an effective major gift strategy could be the key for your organization to achieve greater impact and influence. Next week, we’ll dive into more detailed steps to secure your next (or first) major gift.